As a home cook, one of the ways I work on improving my “chops” is by challenging myself. Sometimes I’ll pick a “secret” ingredient, a la Iron Chef, and other times I’ll prepare what I call a Pantry Dinner. For these, I simply scan the fridge and the pantry for ingredients, check out what produce we have on hand and try come up with something tasty for dinner. (If anyone remembers Gordon Elliot’s Doorknock Dinners show…that’s where I got the idea.) This recipe was the result of one of those “Pantry Dinner” nights. On this particular evening I had to come up with something quick because I was a little late getting home…so late in fact, that I had actually thought of just making omelets and toast. But upon scanning the refrigerator I discovered half a bottle of wine, a package of chicken breast, and ½ a bunch of fresh kale left unused from a previous night. With a stash of whole shallots (Albertson’s has had good ones for 2.99 a pound lately) and a fresh head of garlic I was off to the races. Start to finish this “Pantry Dinner” was on the table in about half an hour. With a piece of crusty whole grain bread, a salad and the rest of the wine this ended up being a rather nice dinner for two…I hope you’ll try it! Carefully place the chicken in the pan, skinned side down and sear until some browning appears around the edges, about 4-5 minutes. Turn the chicken over and cook 1 minute more, cover and place in the oven for 20 minutes. Meanwhile, warm a large sauté pan over medium heat, when the pan is hot add 1 tablespoon of olive and swirl or shake the pan to cover evenly. Season the oil with a few good grinds from the Italian Herb Seasoning Grinder then sauté the shallot and garlic just until the aroma of the garlic begins to fill the kitchen, about 1 minute. Add the kale and toss to coat with some of the oil. Add the wine and a squeeze of lemon juice and cover. Cook covered, 15 minutes or until the kale is tender, stirring every few minutes. Toss again and check for seasoning just before serving. If necessary, add a little salt & pepper to taste. After 20 minutes, very carefully remove the chicken from the oven holding the handle of the pan with a pot holder or “dry” dish towel. Remove the chicken to a plate (or cutting board) to rest. Place the pan with any remaining juices over medium-high heat. As the pan juices begin to boil, stir in the shallots. Cook about one minute then add the white wine and a squeeze of fresh lemon juice. Return to the boil and allow this to cook until about three quarters of the liquid has evaporated. When the liquid in the pan has reached nearly the consistency of syrup, turn off the heat and remove the pan from the burner, stir in the rosemary and half of the butter. Continue stirring and when that butter has melted, stir in the remaining butter. Stir until all of the butter has melted into the sauce and set the pan aside while you prepare your plates. To serve, spoon a healthy serving of the kale onto each plate. 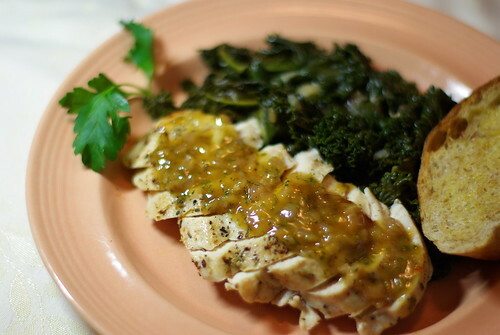 Carefully slice the chicken in diagonal slices, fan the slices out and serve next to, or right on top of the kale with the sauce spooned evenly over the chicken. This entry was posted in Entree, Menu, Poultry and tagged boneless, breast, Chicken, lemon, menu for two, pan, sauce, saute, shallots, skinless, Wine. Bookmark the permalink.